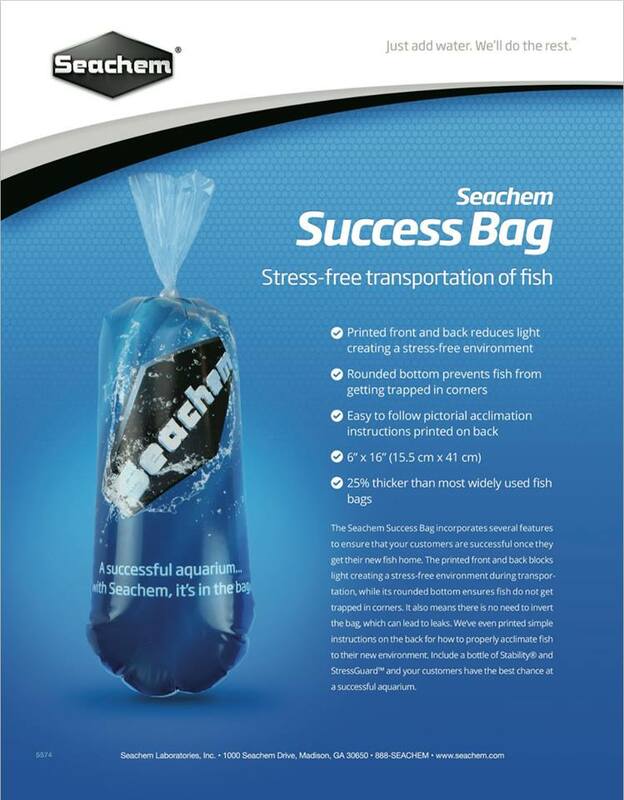 Seachem’s Success Bag, a new addition to their product line, designed to reduce stress and improve shipping success. 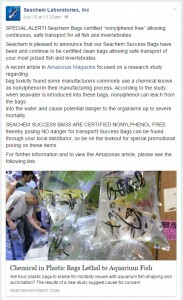 Seachem announces that their Success Bags are certified nonylphenol free. Seachem is pleased to announce that our Seachem Success Bags have been and continue to be certified clean bags allowing safe transport of your most prized fish and invertebrates. A recent article in Amazonas Magazine focused on a research study regarding bag toxicity found some manufacturers commonly use a chemical known as nonylphenol in their manufacturing process. According to the study, when seawater is introduced into these bags, nonylphenol can leach from the bags into the water and cause potential danger to the organisms up to severe mortality. SEACHEM SUCCESS BAGS ARE CERTIFIED NONYLPHENOL FREE thereby posing NO danger for transport! Success Bags can be found through your local distributor, so be on the lookout for special promotional pricing on these items. Is there a way for the hobbyists to get hold of these bags? I buy my bags from my local aquarium society but after reading that article, I am a little scared to use those bags. I have seen WetSpot using these bags. I am not sure if these are for the retail market or just for the people who sell Seachem products!